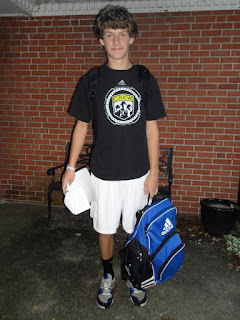 Jack waiting on the bus to his first day of high school. Brian off to his first day of 6th grade at the Middle School. 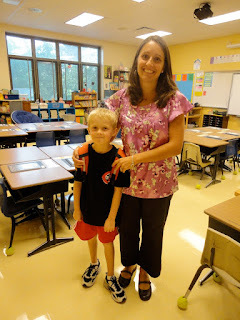 Casey's first day of second grade at the elementary. On our first 1/2 class days of kindergarten we drew lines during writing workshop after we read Lines That Wiggle, read The Night Before Kindergarten and wrote about what we did the night before kindergarten, practiced reading to ourselves during Daily 5, had pretzels for snack, colored our lunch magnets, played tic-tac-toe on the SMART board, made play dough and played in our room and outside. Looking forward to Monday when we are all together for the first time!